August has come to an end and I'm reminded that it has been ten years since I spent a summer in Italy. 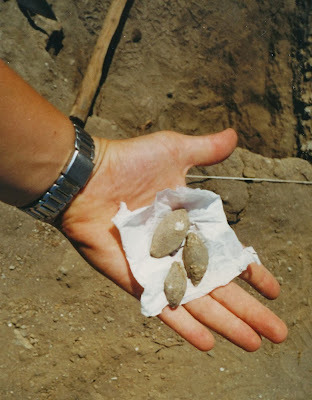 As an undergrad archaeology major, it was required for me to attend a field school course to complete my program. 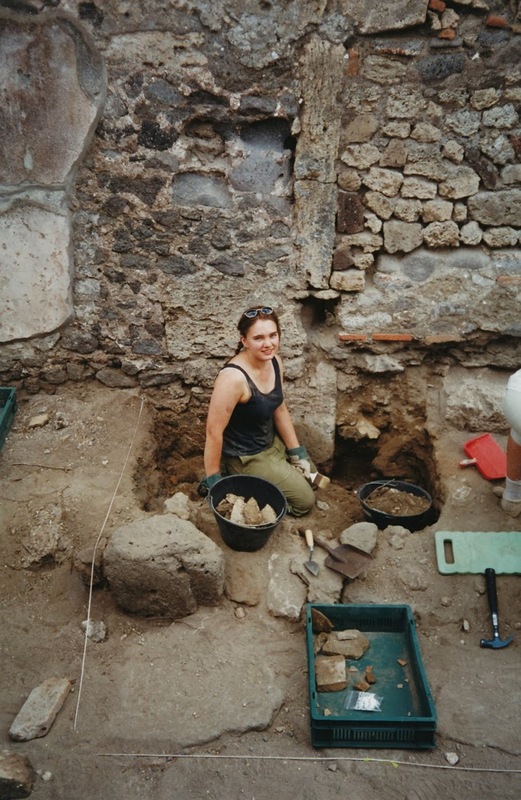 There were field schools in Toronto and in other nearby locations but, me being me, I chose to go to the world's most famous archaeological city and UNESCO World Heritage Site: Pompeii. 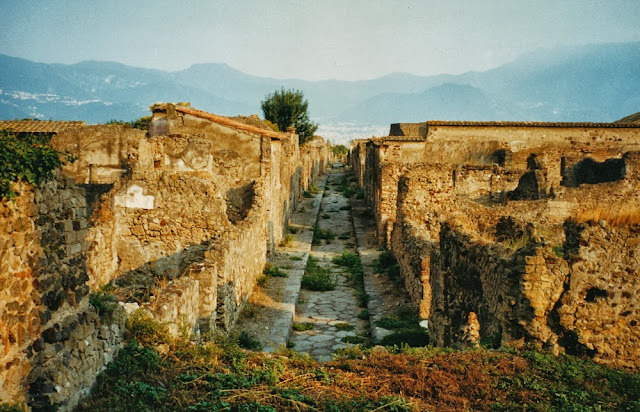 There's no way I could sum up the whole Pompeii summer: there are too many stories to tell even a decade later. There were about 90 people on the project in 1999, students and staff from all over the world. We lived in tents at Camping Spartacus for the whole season where we were fed cappuccino breakfasts, pasta lunches and delectable woodoven pizza dinners. The campground was located directly beside the Circumvesuviana train line. On the first night, when I was dozing in my sleeping bag, the ground started shaking and there was a thunderous rumble: I thought Vesuvius was erupting! It was just a train passing mere metres away from my tent. We were followed around by stray dogs everywhere. I picked up a decent Italian vocabulary quite quickly. We learned a lot about the physics and the chemistry of volcanic eruptions. As archaeologists, we became tourist attractions in our own right since we were photographed, videoed and interviewed. We also got special behind-the-scenes visits to several archaeological sites in the Naples area. 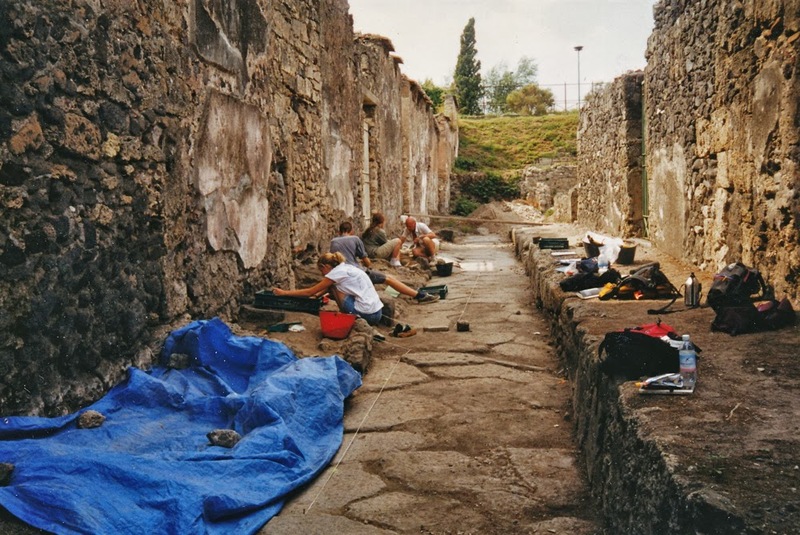 Every morning and afternoon, the group would hike from the lower, modern town of Pompei through the Porta Marina and the forum of the ancient city all the way up to the Porta Ercolano, where the excavation was centred. And every evening, in the free hour or two between work and the dinner bell, I'd explore the ruins. 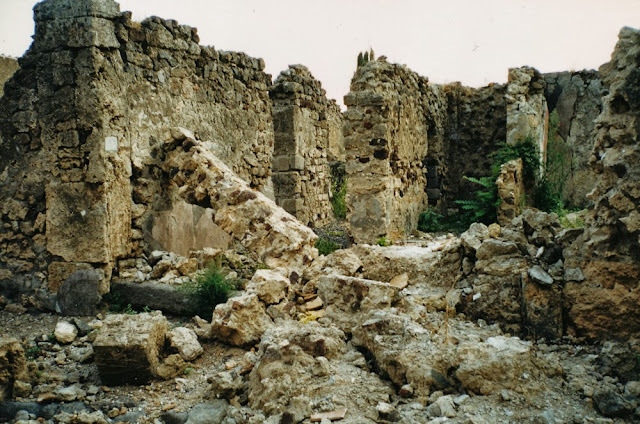 My official archaeologists' permit allowed me to walk around anywhere, so I saw a significant portion of the city that's off limits to regular visitors. It was my experiences exploring Pompeii and observing visitors that inspired me to pursue graduate studies in archaeological site management instead of specializing the archaeology of any one culture or region. There were so many questions that came to mind on site: how is it possible to care for an entire open-air ancient city like this? How can visitor access and site protection be balanced? How is it possible for visitors to understand such a large, complex archaeological site? What about the large unexcavated sections in the city - can these be exposed and studied even as so much of the rest of Pompeii is crumbling? 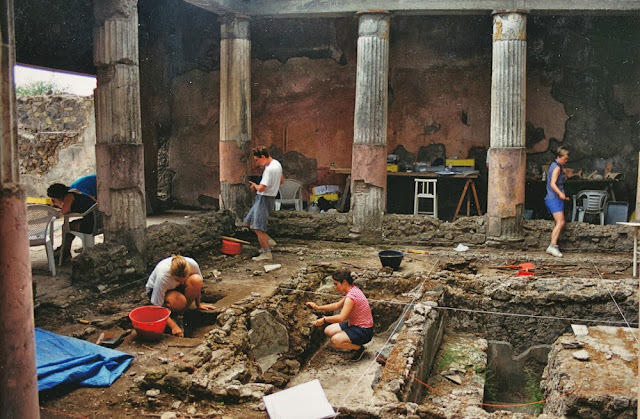 The field school, Anglo-American Project in Pompeii is still running (I think...) and it even got a fancy Archaeology Magazine treatment. That's me, in my trench which was part of the sidewalk on the Via Narcissus (that's the little angled street just east of Via Consolare). It turns out that my square was the spot where people dumped broken pottery. 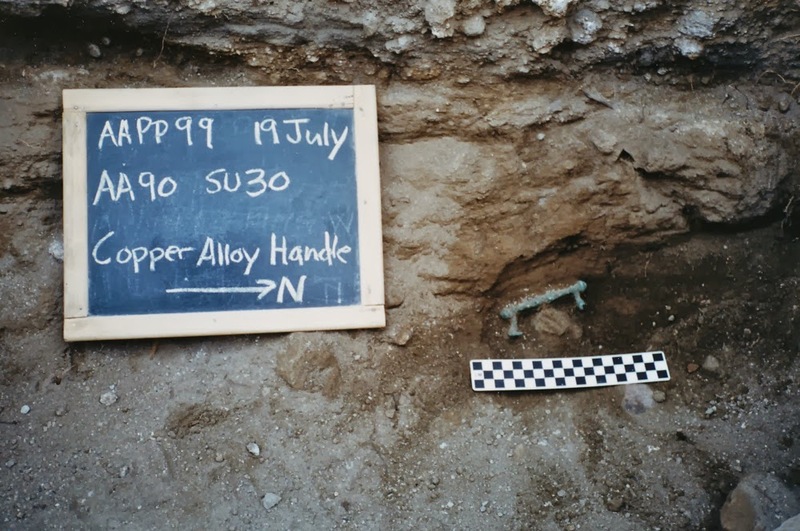 I uncovered stacked-up sherds of the same vessels, where someone had picked up the smashed pieces, cradled them in hand, and then placed them in the alley. One of the lessons at the Pompeii field school that wasn't at most other field schools: standing monument analysis! Also, I learned how to survey manually, although I've since lost that skill. 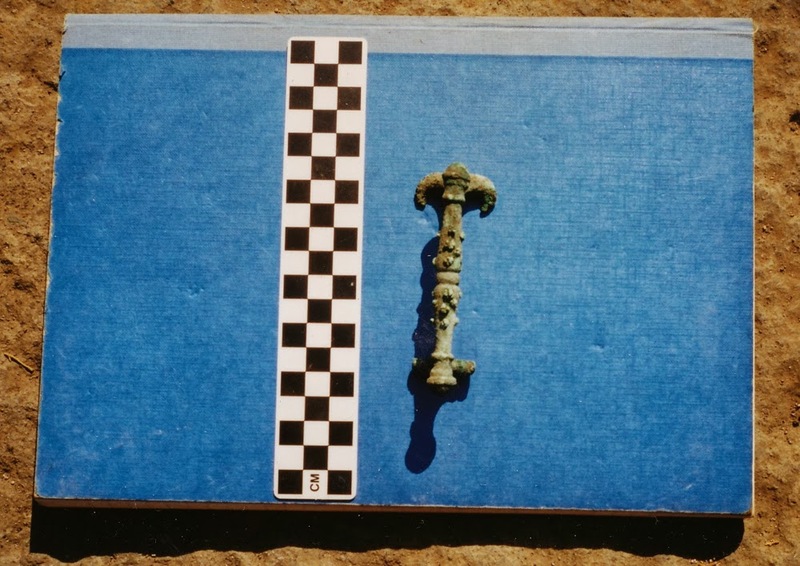 My personal best artifact that summer was an ornate copper alloy handle. The beautiful green of the metal stood out from the gray-brown soil. Excavations around the peristyle garden in the house. It was an important experience for me to be part of such a large team of like-minded students and academics when I was still getting an idea of what I really wanted to study. I learned how to excavate, classify artifacts and survey monuments but I also got myself some kind of direction for the future. UPDATE: A more detailed version of this post was published over at 'Writing The Past'. Sounds like a pretty amazing experience. As someone who doesn't have the travel bug at all, I'm envious! (And your photo albums are way cooler than Flickr by the way).